Vintage jewelry is jewelry dating from roughly the late 1800's to the 1940's. The term usually refers just to European and American-style jewelry, rather than Asian, African, or Native American jewelry of the same period. Jewelry collecting terminology can be confusing because many terms overlap or are used in different ways, and sometimes the term "vintage jewelry" can cover items made as early as the 1700s or as late as the 1970s. The term typically covers costume jewelry, art jewelry, and fine jewelry. Costume jewelry includes mass-produced jewelry made with imitation materials, plastics, or glass. Metal is usually "base metal"; that is, a metal that is not gold, silver, platinum, or other costly metals. Costume jewelry is not always inexpensive-some signed pieces from major designers, such as Coco Chanel, can cost hundreds or even thousands of dollars. Is Sarah Coventry Jewelry Still Available? Art jewelry is largely handmade, although some components may be manufactured, with particular emphasis on one-o-f-a-kind design. Some items, such as Salvador Dali's, are produced in limited editions. Fine jewelry usually means any kind of jewelry made of precious metals or with precious stones, but it can also refer to high-quality silver jewelry or jewelry with semi-precious stones, such as George Jensen's. Fine jewelry may be either largely machine-made or hand-produced and either one-of-a-kind or mass produced. Vintage jewelry is classified by periods, though even these have some overlap. Major categories appear in bold type. 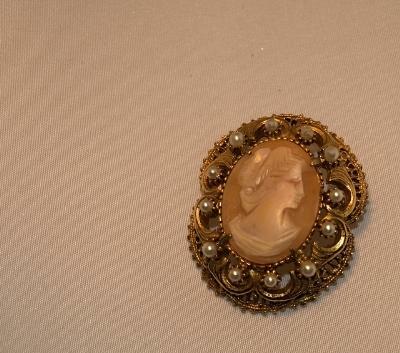 Victorian jewelry comes in many styles, one to suit nearly every taste. Early- and mid-Victorian style often reflects historical images, particularly Greek or Roman, Egyptian, Middle Ages, or Renaissance. Semi-precious stones such as garnets and amethysts were popular, as were Australian opals, which Queen Victoria particularly loved. The Queen's love of the Scottish Highlands made Scottish-style jewelry, particularly agates and jasper (known as pebble jewelry) and thistle motifs, very popular, and during her extended mourning period for Prince Albert, jet and other forms of mourning jewelry were widespread. Art Nouveau was a reaction against the usually heavy and somber colors and styles of the Victorian era, even though, like Victorian jewelry, it often used historical themes, especially from the Middle Ages. It emphasized flowing lines and softer colors, and customarily used cabochon (rounded, instead of faceted) semi-precious stones, opals, pearls, and enamel. This, plus the use of silver as often as gold, allowed even the high-end designers to carry more affordable pieces. Many art nouveau designers favored simplicity, but others created elaborate pieces. Trivia note: Women jewelers played a much larger part in the Art Nouveau and Arts and Crafts movements than they ever had before. Green, white, and violet were a common color scheme, sometimes used deliberately to stand for "Give Women the Vote." Art Deco jewelry, by contrast, often used bold lines, geometrical styles, and vivid colors. Faceted cuts and precious metals returned to favor, as did large centerpiece stones. However, many art deco designers, like some of their art nouveau predecessors, emphasized simplicity, though this was almost an industrial simplicity rather than nature-inspired. Many art deco jewelers were inspired by architecture, and one can see the same powerful lines in both jewelry and buildings. Like most other antique collectibles, the value of vintage jewelry depends on rarity and condition, and like collectible coins, it also depends on the value of any precious metals it might contain. The size, cut, clarity, kind, and condition of the stones (if any), also affect the price. Be careful of buying reproduction jewelry as the real thing. Many of the famous designers' works were widely imitated, so check for signatures. Most fine jewelry is signed, as is a good deal of high-end costume jewelry.